48 x 34 Walk-in Shower with Seat is one piece with 5 inch threshold and center drain. Fiberglass shower with classic 4" tile look and molded-in seat. Luxurious polyester gelcoat finish. Custom tile accenting is available. Full plywood backing on all walls for outstanding strength and customized installation of accessories. No mud setting required. THE STANDARD Walk-in SHOWER with Seat COLOR IS WHITE. THE SHOWER IN PICTURE IS FOR DISPLAY PURPOSES ONLY AND SHOWS AN EXAMPLE OF HOW YOU CAN OPTIONAL CUSTOM TILE ACCENTING TO CREATE A ONE OF A KIND SHOWER. MADE TO ORDER PRODUCT | SHIPS IN 3 - 5 BUSINESS DAYS when ordered on Standard Business Days (M-F) before 12PM EST. Quick Tip - This barrier free shower has integrated plywood backing! Integrated Plywood makes installing accessible add-ons; like grab bars; a breeze. Safety, Beauty and EZ Maintenance! Accessible shower stall made of fiberglass. A barrier free shower with a tile look. Luxurious polyester gelcoat finish. Custom tile accenting available. Full plywood backing on all walls for outstanding strength and customized installation of accessories. 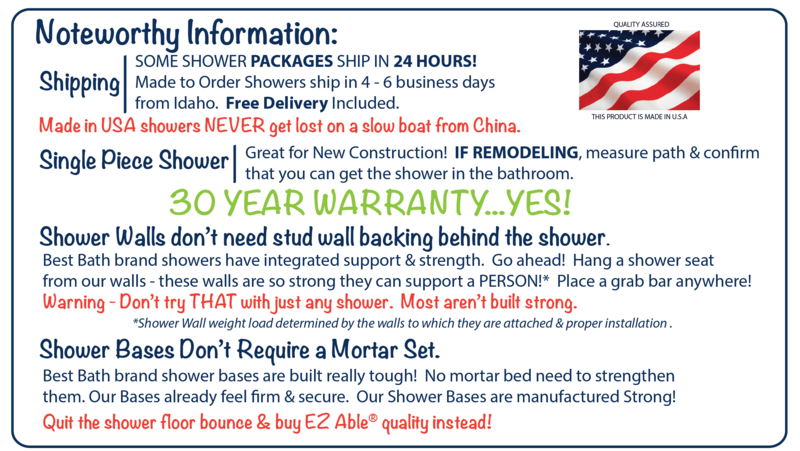 Accessories available: Shower valve, glide bar/hand shower, seat, grab bars, collapsible water stopper, drain, curtain and rod. All accessories are priced separately. The standard shower PAN is WHITE. Many custom body colors are available. Building Codes Before installing any EZ Able product check with your local building department to insure compliance with the local building codes. EZ Able, LLC is not responsible for any conflicts with local building codes.